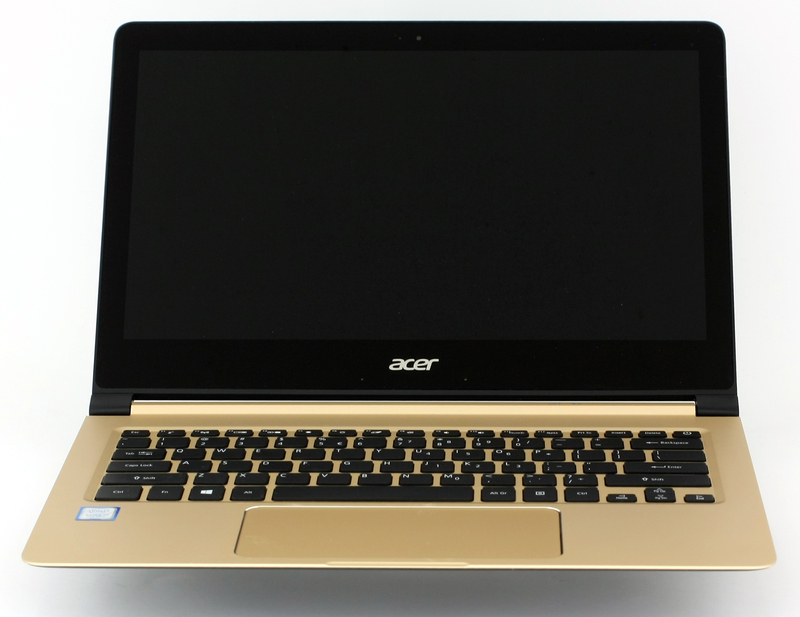 Announced at this year’s IFA, the Swift 7 is the latest ultra-portable device from Acer and comes just in time to adopt the improved 4.5W KBL-Y processors. Now branded as Core i7-7Y75, the processor comes as a direct successor to the Core m7-6Y75 but as Intel promises, it packs a number of changes under the hood providing better power optimization and up to 30% better performance in some scenarios. Aside from the new Kaby Lake CPU running the show, the notebook has a number of key selling points that make it stand out in the already overcrowded ultra-portable market segment. For starters, the Swift 7 dethrones the HP Spectre 13 as the thinnest notebook ever made with profile measuring just 9.98 mm and weighing as much as 1.084 kg. That’s darn impressive for a 13-inch laptop. This, of course, comes at a price with some design limitations as you will see in the review below. Another key feature is the aluminum unibody design with surprisingly sturdy construction including a large touchpad. The package, in which hte notebook arrived, offered more than the bare minimum. It had the usual set of user manuals, AC adapter and two USB-C dongles. One of them is USb-C to HDMI and the other one is USB-C to USB-A 3.0. In terms of design and construction, the Swift 7 is truly remarkable not only because it’s ultra-thin and light but also because it’s super sleek with premium appearance and sturdy overall construction. The only plastic you will find on this laptop are the hinge caps and the side of the screen bezels. This is probably for better Wi-Fi reception rather than a design solution. We start off with the lid. It’s covered in anodized black aluminum with a hint of matte finish on top, which attracts a ton of fingerprints and smudges. They are quite visible so frequent cleaning is a must. You will also notice a small plastic bar on top of the lid, which is also designed for better Wi-Fi reception because the antennas reside in the laptop’s lid. Speaking of which, it’s quite sturdy and gives in ever so slightly under pressure but it’s really hard to twist due to the Gorilla Glass 4 protection on the screen and the aluminum used for the build. The hinges, on the other hand, appear to be a bit too tight. Unlike the HP Spectre 13 laptop, which had extraordinary stealth and linear hinge travel making it extremely easy to open with one hand, the Swift 7 needs both hands to be opened. And as for the bottom side, the laptop uses the same anodized aluminum plate but this time drops the matte finish. It’s super easy to open and you can access the internals in no time. The sides of the notebook don’t offer anything out of the ordinary and have a modest set of connection options. Probably due to design limitations, the notebook doesn’t feature all the usual connection types and just like the Spectre 13, this one is fully invested in the USB-C bandwagon. You will find two of those on the right side but there’s little difference between them. The one next to the 3.5 mm audio jack can be used for external displays supporting HDMI 1.4b output, data transfer up to 5Gbps due to the Gen 1 standard and can be used for charging the device. The other one can only be used for power delivery and data transfer, again up to 5Gbps. It’s quite unfortunate that the device doesn’t support the latest USB-C Gen 2 protocol for faster data transfer and Thunderbolt connectivity. This is a must-have feature for most users when using a USB-C-only device. 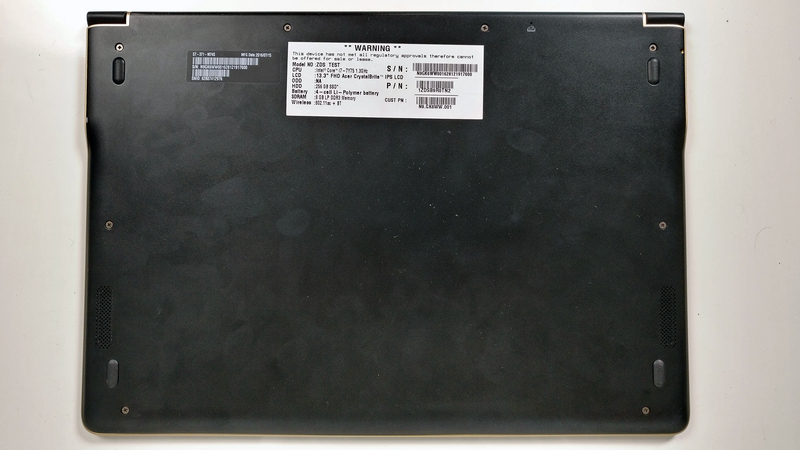 The HP Spectre 13 for instance, delivers both connection types with three ports – two of them are Gen 2 and the other one is Gen 1. The elegant razer-sharp chamfered edges on the sides are part of the interior aluminum gold-colored plate. We’ve got slightly concaved keyboard tray for added comfort when typing and HP-style long but narrow touchpad with diamond-cut edges around it. The touchpad feels pretty nice, offers quite the stable clickable surface and it’s accurate enough for comfortable use. A bit of more precision when making small movements of the cursor would have been nice but let’s not get too picky. The keyboard, however, feels a bit narrow. Not as narrow as the one on the Lenovo Yoga 900S, which was barely usable but the short key travel can be felt easily, especially on the space bar. You will witness generally accurate and fast typing experience with not enough prominent tactile feedback. Also, the keyboard tray sinks in under pressure but doesn’t affect the user experience so it’s fairly negligible drawback. At the end of the day, the design and construction of the device are probably the key selling points and we can clearly see why. It’s absurdly thin and light without compromising in build quality. The only small drawback of the device would be the reduced key travel of the keyboard and the limitation of the USB-C ports. There’s not much you can tinker with this laptop as most of the hardware is either soldered to the motherboard or it’s missing due to design limitations. In this case, you can only access the M.2 SSD slot and the Wi-Fi card. At least the process of accessing is pretty easy. As expected, the notebook comes with an M.2 drive, but what’s unexpected is the size of the stick and its supported standard. 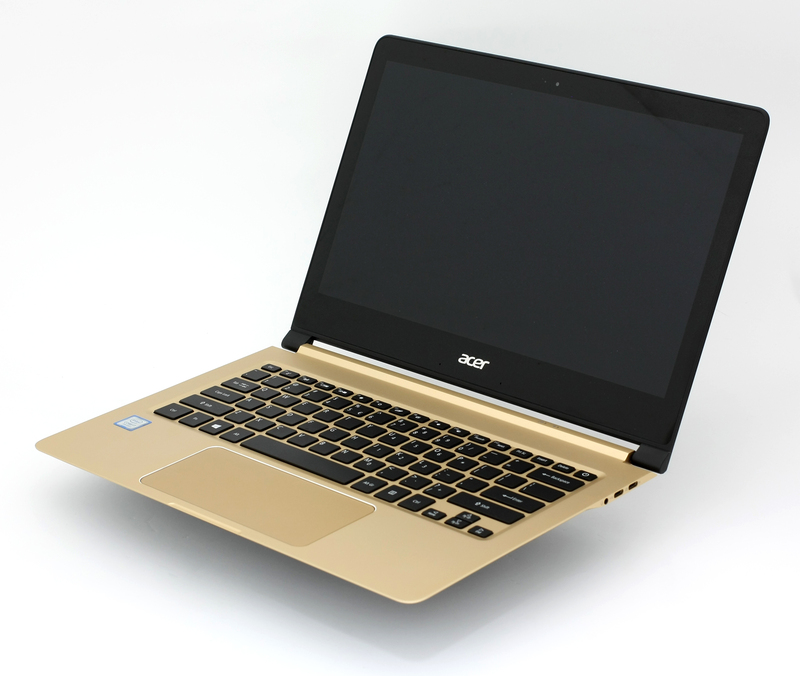 Unlike most high-end ultrabooks, the Acer Swift 7 lacks the PCIe NVMe drive and uses a normal M.2 SATA SSD Kingston coming in 2242 size. That’s pretty disappointing because most notebooks, which are priced similarly to this one, offer the ultra fast PCIe NVMe standard out of the box. Of course, the memory is soldered to the motherboard and can’t be upgraded as well. The Wi-Fi module is a Qualcomm Atheros QCNFA34AC and it’s located in the upper left corner of the device near the screen hinge. 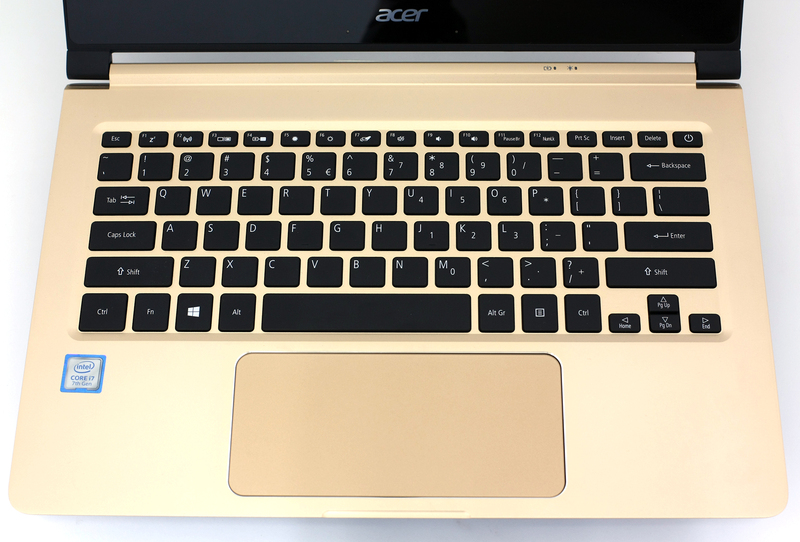 Taking away most of the free space, Acer has supplied the notebook with a 41.58 (2700 mAh). 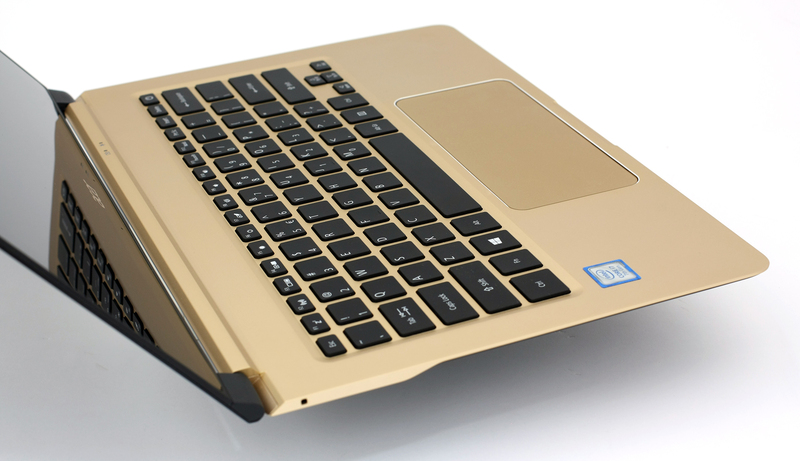 Since this is a fan-less design, the notebook doesn’t use the conventional heat pipes and fans for cooling. The Core i5-7Y54 CPU with a TDP of just 4.5W allows good performance without the need of any major healing solution – just a heat sink and some vent openings for some air flow. 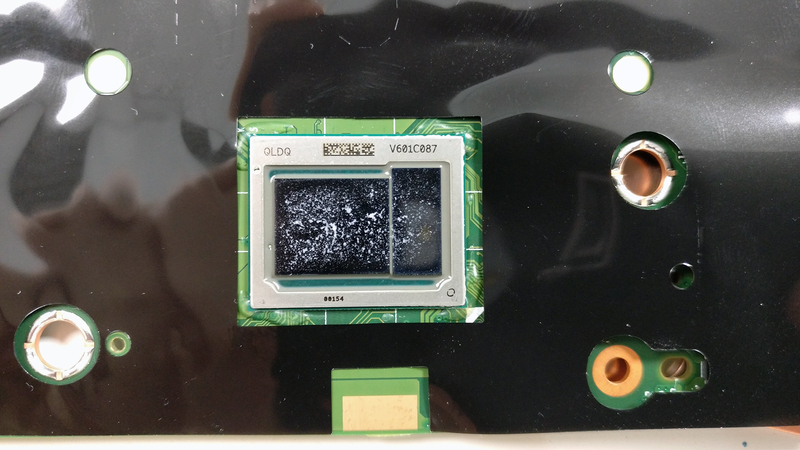 You can see some shots of the chip itself in the photos below. 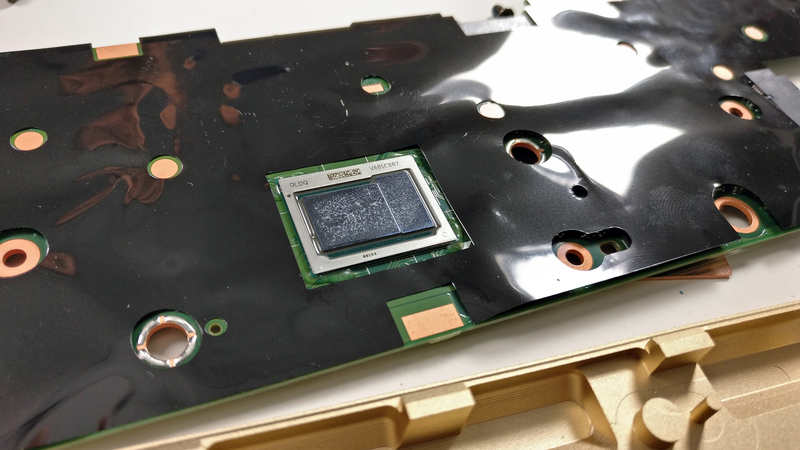 The white dots are part of the thermal paste that has been applied. 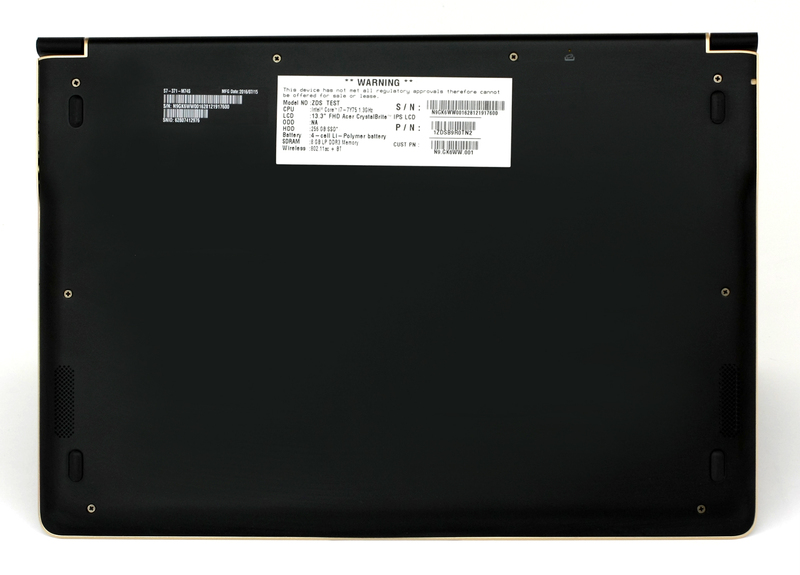 The notebook’s display is the same we find in the HP Spectre 13 – CHI MEI CMN1367 – a Full HD IPS panel with 167 ppi and 0.15 x 0.15 mm pixel pitch. It can be considered as “Retina” when viewed from a distance equal or greater than 50 cm. We were able to record a maximum of 272 cd/m2 brightness or 260 cd/m2 as average across the surface leading to a deviation of 12%. This might fall short for outdoor use, though. The color temperature is close to optimal – 6770K. We also measured an excellent contrast ratio of 1370:1 before calibration and 1130:1 after. As you can see in the image below, the maximum color deviation dE2000 is 3.0 in the bottom center of the screen while the maximum allowed value is 4.0. 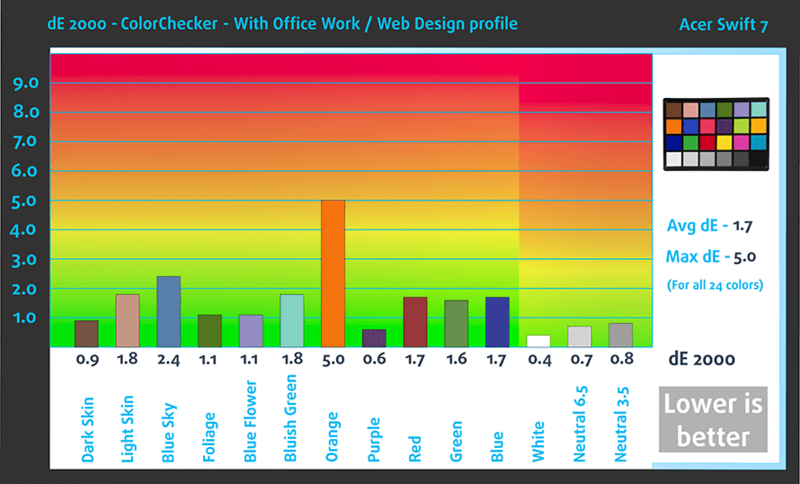 We measured that the sRGB coverage is 91% which is an excellent result for multimedia content. 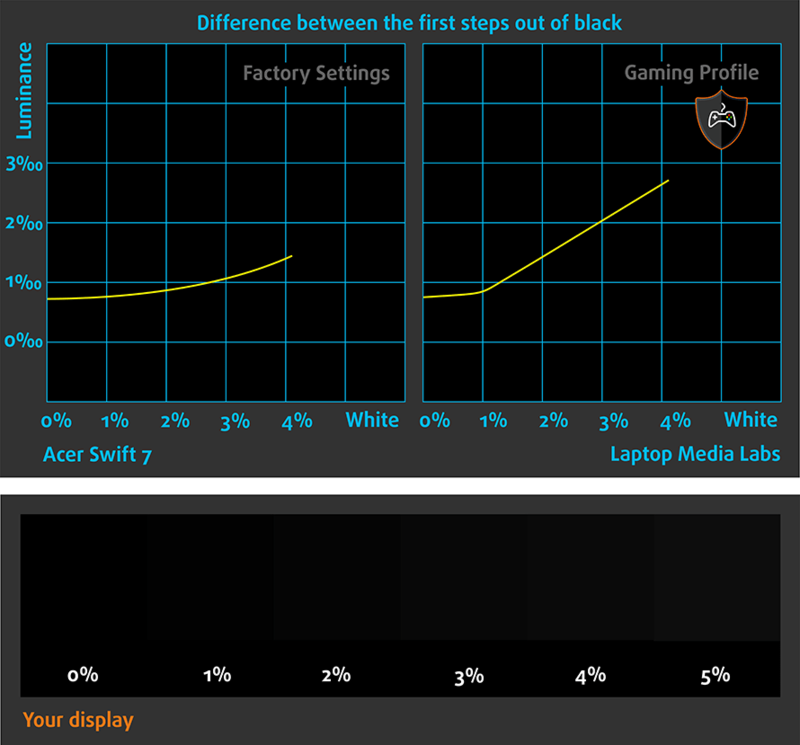 We created the these profiles with 140 cd/m2, optimal color temperature and gamma under sRGB mode. The notebook’s display appears to be quite harmless to your eyes, although these results were quite different on the HP Spectre 13. We recorded PWM only below 17% (95 cd/m2) brightness and even then, the frequency of the emitted light is quite high and will not affect most users – 25 kHz. The notebook’s display shows excellent properties for good multimedia experience – it’s bright enough for indoor use but not quite for outdoor environment. 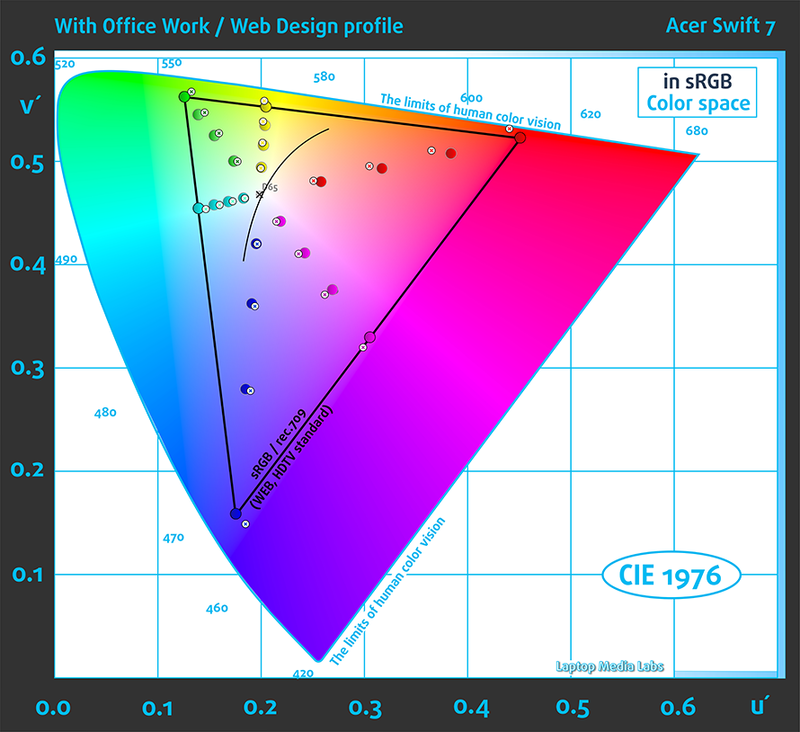 The sRGB coverage is wide, the contrast ratio is really high and the best part is that it’s mostly harmless to your eyes emitting pulsating light only below 17% luminance. 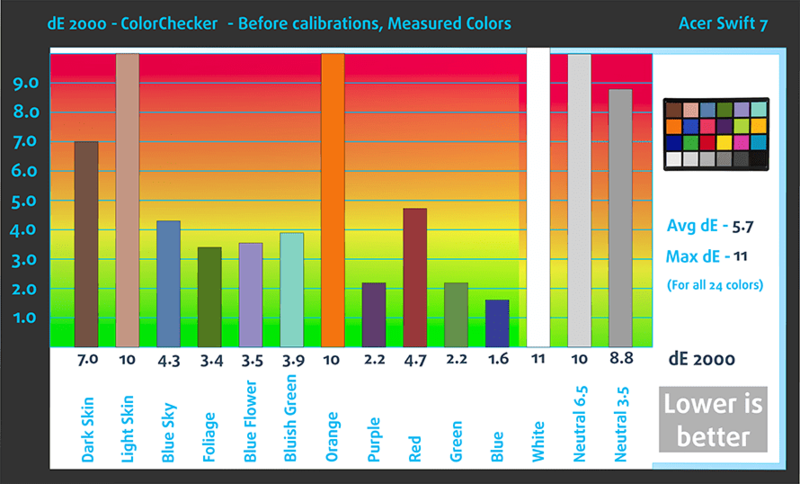 There’s not much we can ask for but our profiles will come in handy when lowering the negative blue light emissions and adjusting color temperature, color accuracy and gamma. The sound quality is on par with the competition. All frequencies sound crisp and full. 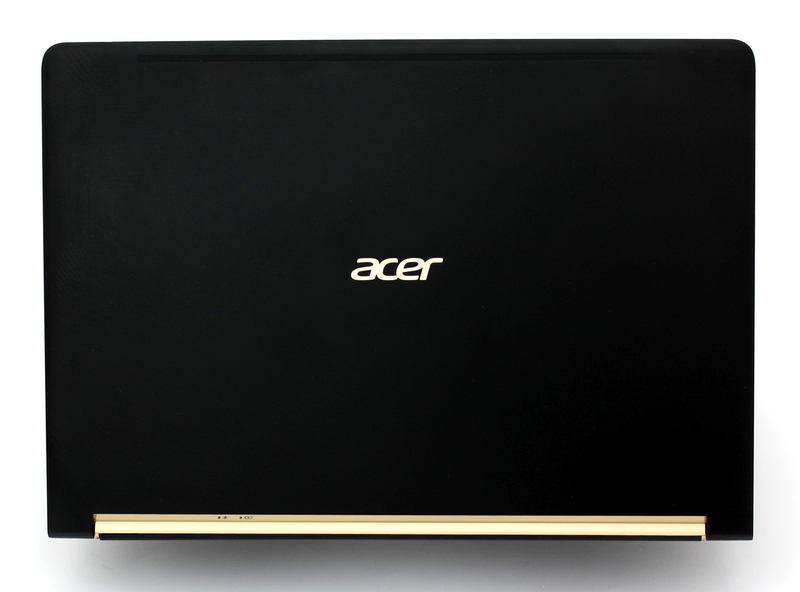 The notebook came with pre-installed Windows 10 (64-bit) out of the box but if you wish to perform a clean install of the OS, you can download all of the latest drivers from Acer’s official website. 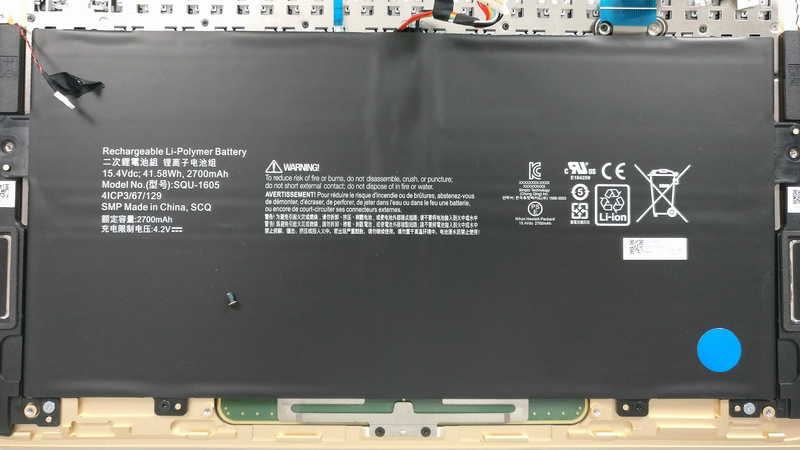 To be honest, we’ve seen better battery performance in other high-end notebooks but in this case, in which the laptop is less than 1 cm thin, we can say that its runtimes are good enough to get you through the day. 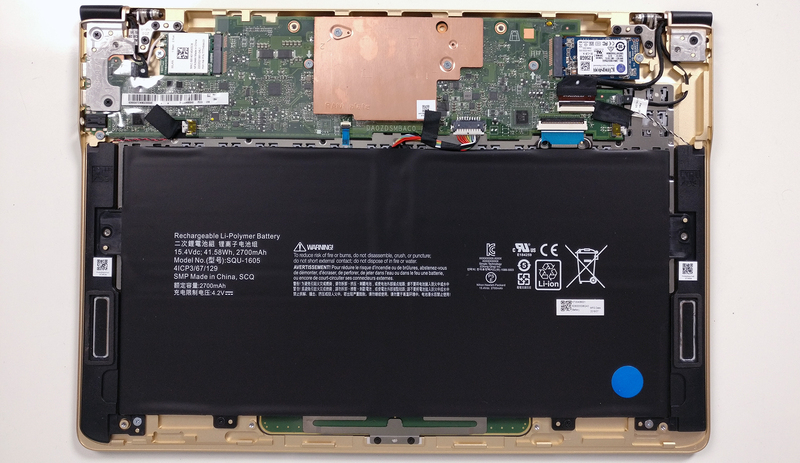 The 4.5W energy-efficient Core i5-7Y54 chip paired with a 41.57Wh battery produced a satisfactory result. We have to admit, though, we were expecting a little bit more from this not so demanding hardware and tiny screen. Of course, all tests were performed with the same settings as always – Wi-Fi turned on, Windows battery saving feature turned on and screen brightness set to 120 cd/m2. Good web browsing runtime – 423 minutes (7 hours and 3 minutes). slightly lower but still good enough result – 396 minutes (6 hours and 36 minute). The Intel Core i5-7Y54 is a direct successor to the Core m5-6Y54 (Skylake) SoC offering a slight improvement in terms of performance and power efficiency over the latter. It’s part of the Kaby Lake generation (7th Generation) using the same architecture as we saw in Broadwell and Skylake chips, although, Intel markets the improved architecture by naming it 14nm+. Aside from the identical features to the last generation that the SoC offers such as HyperThreading, the clock speeds have been increased significantly. While the Core m5-6Y54 was clocked at 1.1 – 2.7 GHz, the newer i5-7Y54 can go from 1.2 to 3.2 GHz. The SoC also incorporates an Intel HD Graphics 615 (clocked at 300 – 950 MHz) – just like the rest of the KBL-Y chips – and supports LPDDR3-1866 memory. The whole SoC is rated at 4.5W including the memory controller making it suitable for fanless, ultra thin tablets, notebooks and 2-in-1 devices. Here you can see an approximate comparison between the CPUs that can be found in the Acer Swift 7 (SF713-51) models on the market. 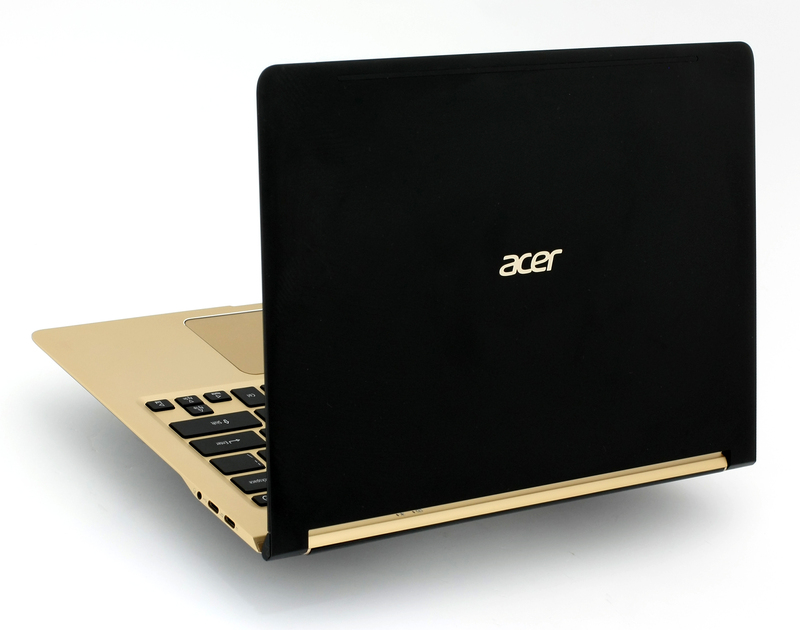 This way you can decide for yourself which Acer Swift 7 (SF713-51) model is the best bang for your buck. Fritz is a chess benchmark that tests the computing capabilities of the CPU with various chess moves. The Intel Core i5-7Y54 reached 4.409 million moves per second. By comparison, one of the most powerful PCs, Deep(er) Blue, was able to squeeze out 200 million moves per second. In 1997 Deep(er) Blue even beat the famous Garry Kasparov with 3.5 to 2.5. This test isn’t the best representation of real-life usage but it’s still a good way to determine the overall stability of the system and in this case, how the notebook utilizes the CPU. We started off with 100% CPU load for an hour and from the very start of the test, we noticed that the CPU wasn’t able to reach its full potential. The clock speeds didn’t exceed 2.2 GHz and eventually went down to 1.8 GHz. This still within the Turbo Boost range of the SoC (1.2 – 3.2 GHz) but it seems that it can’t utilize the full speed. This might also be the reason for the lowered performance, which is on par with ASUS’ ZenBook UX360CA with Core m5-6Y54. 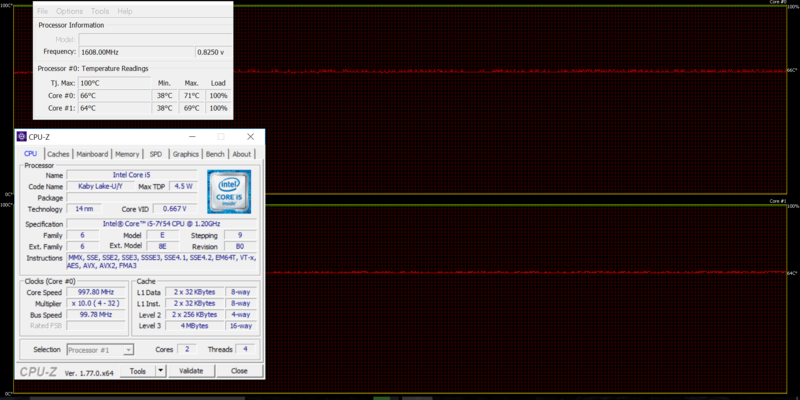 We also ran the GPU stress test and observed throttling, which is a normal occurrence in most ultrabooks. This way the CPU gives enough headroom for the GPU to perform. Despite the metal interior, we didn’t notice the heat spreading too much across the interior. The only hot spot was near the screen hinge where the processor is located while the wrist rest area and the center of the keyboard remained relatively cool. However, the Swift 7 is another fallen victim to the ultra thin fad. And just like the Lenovo Yoga 900S and the HP Spectre 13, Acer’s thin solution sacrifices much-needed features along the way. It also has crippled Core i5-7Y54 on board – much like the Spectre 13 with the Core i5-6200U and Core i7-6500U. We also can’t get over the fact that the Swift 7 ships with M.2 SATA drive instead of the fast PCIe NVMe SSDs, which have become a standard for high-end ultrabooks. To the list of missing features, we have to add the absence of keyboard backlight and limited ports as well. 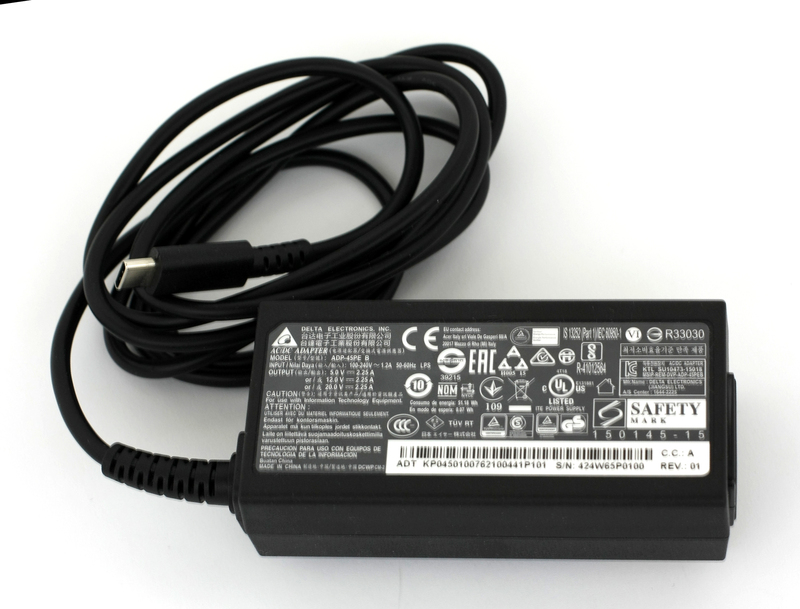 Acer has included two dongles for HDMI and USB-A in the package but with one of the connectors being used for charging, you are left with only one. At least, the HP Spectre 13 included 3 Type-C ports, two of which are Gen 2 and support bandwidth of up to 10 Gbps making it suitable even for larger connector hubs. Still, if you are looking for a portable, luxurious traveling companion, the Swift 7 is probably the right one for you if you don’t mind the lack of some essential features.